Wunderlist is a cool task management application available for Windows, Linux, Mac, iOS and Android. Wunderlist 2 was announced a few days ago, but it's not yet available for download and as you know, to use Wunderlist in Ubuntu, you need some tweaks or else the application doesn't start. So, until the new version is ready, you can use our script to get Wunderlist to work in Ubuntu. 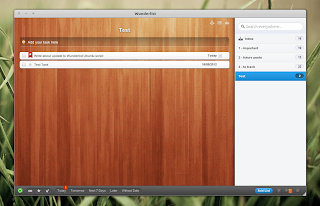 Today I'm releasing a new version of the script that gets Wunderlist to work with Ubuntu. The changes in the new version include: support for Ubuntu 12.10 Quantal Quetzal and appmenu support for Ubuntu 12.04, which was broken until now. The Wunderlist desktop application is not a must, as you can use Wunderlist in your browser, but using the application and our script, you'll get a desktop file so you can launch Wunderlist from the menu / Dash and create or edit notes offline. To download the script and use Wunderlist in Ubuntu 12.10, 12.04 or 11.10, see our initial post (now updated with the new script version): How To Install Wunderlist In Ubuntu 12.10, 12.04 or 11.10.